A draft of this post was sent earlier in error. Below is the full post. We would do well to listen to students more. They are more connected to the “real world” than most adults were at their age. They follow the President on Twitter. They watch live protests in Romania on Snapchat. They are learning to constantly question information. Part of this is being a teenager. But there are 15 million public high school students in the United States, who, as an entertaining collective, would be the fifth most populous state. Their voice matters. 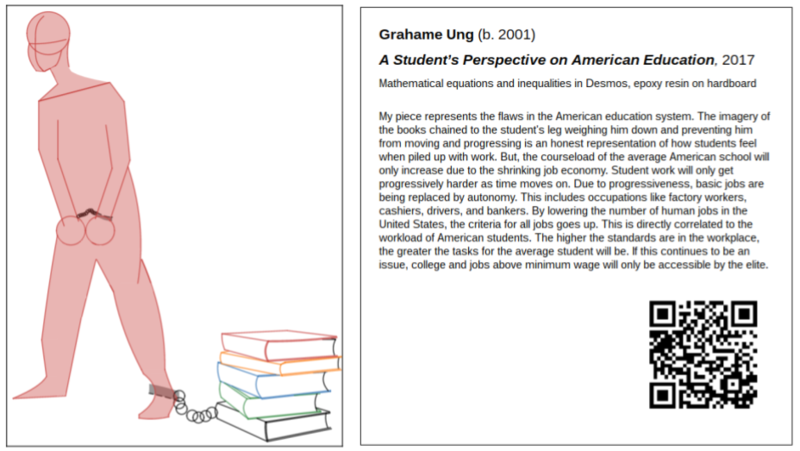 Next week’s exhibition at the Bruce Museum (6:30-8:30, Greenwich, CT) is a testimonial to student voice. Our students are more mature than their snap selfies would initially suggest; they are thoughtful, deep thinkers. Their art is a filter between their thoughts and the public. Last week, Sarah explained why projects and exhibitions are worthwhile. In reading students’ museum cards, I am reminded that beneath the bright colors, there are bold statements being made. I invite you to read two in advance of the exhibition. We are excited to watch them find their voice in person next week. 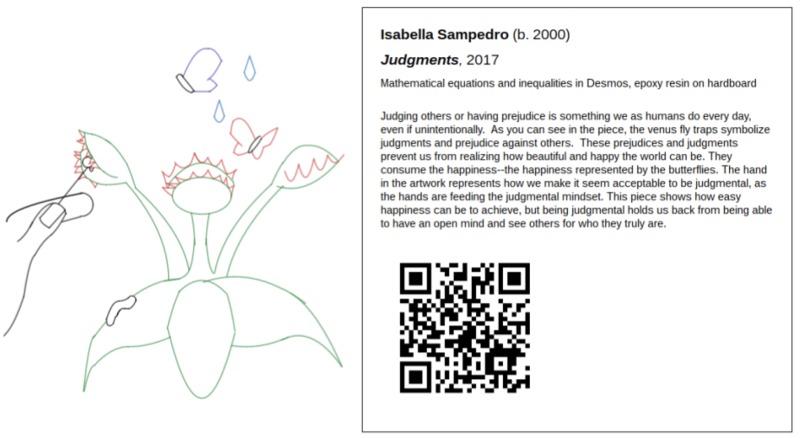 Students were asked to make a piece of art using only equations in the graphing calculator Desmos. The prompt: create an image that symbolizes opposing aspects of your identity or which comments on a change you would like to see in yourself. PS. Some photos from the week! To see the rest of the art, plan to visit the Bruce Museum on Wednesday, February 8, from 6:30 to 8:30 PM. Zach works on his physical piece. Eva tests gears on her physical piece. Desmos artwork dries after being layered with epoxy. Isabella and Hannah paint the backgrounds for their Desmos artwork. This entry was posted in Announcements, Weekly Wrap-ups. Bookmark the permalink.